Born and brought up in Winterthur, Switzerland. Undergraduate studies in Zoology and Molecular Biology at the University of Zürich, Switzerland. Postgraduate studies in Zürich and at the M.R.C. Laboratory of Molecular Biology in Cambridge, UK with Dr. Mariann Bienz on the function of homeotic genes and wingless signalling in Drosophila midgut development (Publications). Postdoc with Prof. Randall Moon at the University of Washington in Seattle, U.S.A. studying Wnt signalling in early amphibian development (Publications). Postdoct. Research Assistant with Dr. Enrique Amaya, Univ. of Cambridge, U.K.. 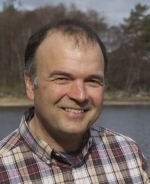 Principal Investigator at Wellcome Trust Biocentre, University of Dundee. With the University of Aberdeen since summer 2003. The tissues and organs of developing embryos are organised by cell-to-cell signalling. These interactions are mediated by a relatively small number of signalling molecules. These signals are repeatedly used at different stages of development and in different tissues of the embryo. Wnts are one important class of such signalling molecules. They are secreted glycoproteins which function as cell-to-cell signals in develomental processes in all multicellular animals examined. Abnormally activated Wnt signalling is also involved in certain types of tumours such as breast and colon cancer. We want to understand the normal role of Wnt signalling in patterning the developing vertebrate embryo. Where and when are Wnts used during embryogenesis and what is their function in different organs and at different stages? We have recently analysed the molecular mechanisms of tissue-specific Wnt signalling and are currently studying Wnt function in heart and brain development. We use Xenopus as our model system and apply modern techniques, such as transgenesis and antisense oligos. In collaboration we also using human Embryonic Stem Cells to model the functional role of Wnt signalling in heart muscle differentiation.